What is going on with my lawn? If you’ve had unusual brown patches or blemishes appearing on your lawn this summer… don’t automatically take it out on the neighbour’s dog. Lawns can catch diseases that cause these unsightly blemishes. 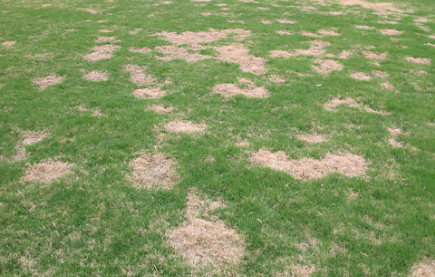 For lawn diseases to occur they require a few conditions to be present all at the same time. When a pathogen (disease spores), comes in contact with a susceptible host (your lawn), and the grass is wet or damp for long periods of time… Ba-da-bing Ba-da-boom… brown patches of grass! The diseases are identified by the different ways they distort the grass blades, the size and colour of the patches and the time of year. Although fungus control sprays are available, they are usually quite expensive and work better to prevent the disease, rather than eliminate the fungus once it’s started. In most cases proper mowing and fertilizing keeps a lawn healthy enough to withstand most disease problems. The biggest factor to avoid is watering in the evening. Grass blades that remain damp during warm summer nights provide the moisture for the disease to thrive. These patches are initially pinkish and eventually dry out to a tan colour. Upon closer observation, a distinctive red to coral coloured “thread” is often seen growing from tips of the grass blades. These spots are usually straw-coloured and 6-12 inches round. A whitish hourglass shape on the grass blades distinguishes the leaf blades. This disease is evident as a whitish film on the grass blades. It’s most common on Kentucky bluegrass grown in shady damp areas, such as between houses. This fungus affects all types of grass and is normally found to some degree in all home lawns. Symptoms are yellow to brown spots and blotches on the grass blades. In severe cases the disease can advance to a condition known as “melting out” where the fungus becomes very prevalent throughout the lawn. At this stage the lawn has large yellow and brown patches and blades seem to be rotting at the base.